The well-known academic, Henry Mintzberg writes that strategy is a pattern of decisions. He argues (convincingly) that strategy is more than the intent to accomplish the vision; it is also the emergent result of manager’s activities. Patterns are those arrangements or systems of internal relationship, which give to any culture its coherence or plan, and keep it from being a mere accumulation of random bits. The phrase “coherence or plan” jumped out at me. I’m sure I’m like many others in simply thinking of a plan as a premeditated and deliberate view of the steps, activities, and resources needed to create some future. For example, a strategic plan frequently is nothing more than an artifact that is attempts to capture each manager’s view of goals and resources to attain those goals. I now realize that that there is a more profound and fundamental perspective on “the plan,” it is only a good plan if it makes good sense. Most organizations pursue multiple objectives that are unconnected with one another (and sometimes even conflict).They are anything but coherent! “Strategic coordination, or coherence, is not ad hoc mutual adjustment. 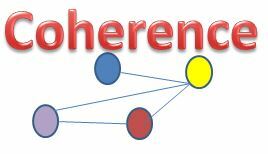 It is coherence impose on a system by policy and design…specifically how actions and resources will be combined. Another way to encourage coherence is to activate the Chief Story Teller role, and use some of the many ideas that I have already provided on storytelling and branding. Chances are that when things (strategies, goals, resources) don’t make sense, it’s already well known. What is missing is a useful narrative and the courage to discuss the incoherence. “None of the people who are racking up amazing success stories and creating cool stuff are doing it just by working more hours than you are. And I hate to say it, but they’re not smarter than you are either. They’re succeeding by doing hard work. Coherence is not a silver bullet for strategic initiatives, but a useful organizing framework. Do you agree? This entry was posted in How to Improve Your Story Telling Chops, Interpreting Strategy Documents, Strategy, Ambiguity, and Strong-Minded Thinking, Useful Practices & Management Tools and tagged Problem Solving, Strategic initiative, Strategic Planning Issues for Strategic Initiatives, strategy execution. Bookmark the permalink. Reblogged this on Goals Strategy Coaching.